I could hear it howling outside while it was still dark. By morning it was gusting up to 33 mph hour. But I didn’t know that. Better not to check the weather app. I’d find out soon enough. Very little keeps me from my morning run. Certainly not a little wind. So out I ventured. I fairly flew down the Lakewalk going with the wind, but had a hefty price to pay on my return. It was a battle just to get home, and I got plenty of sympathetic looks from the runners going the other way. Rich had much different ideas about the wind. Clearly it was an opportunity. 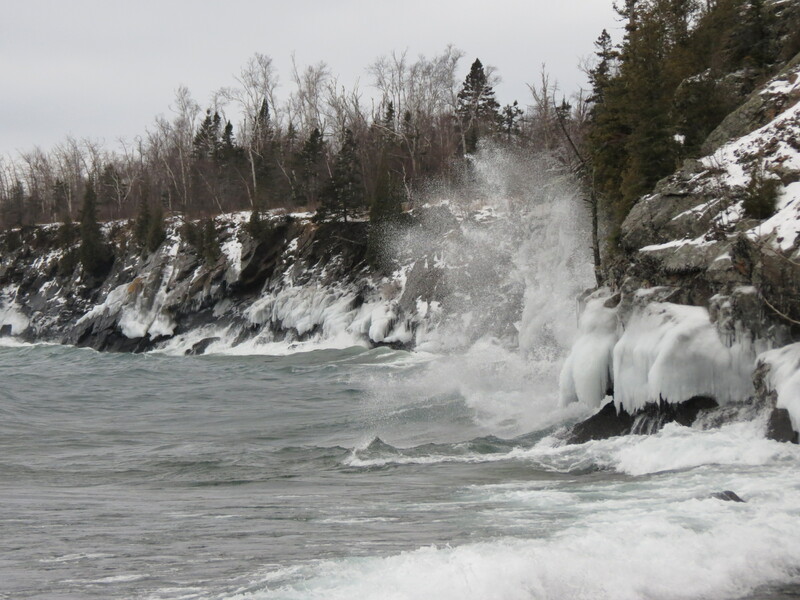 He was eager to see the resulting waves on Lake Superior, so after lunch we ventured up the North Shore in search of “splashing and dashing.” With the wind coming out of the NE, it brought all the ice down to our end of the lake, packing it against the shore. 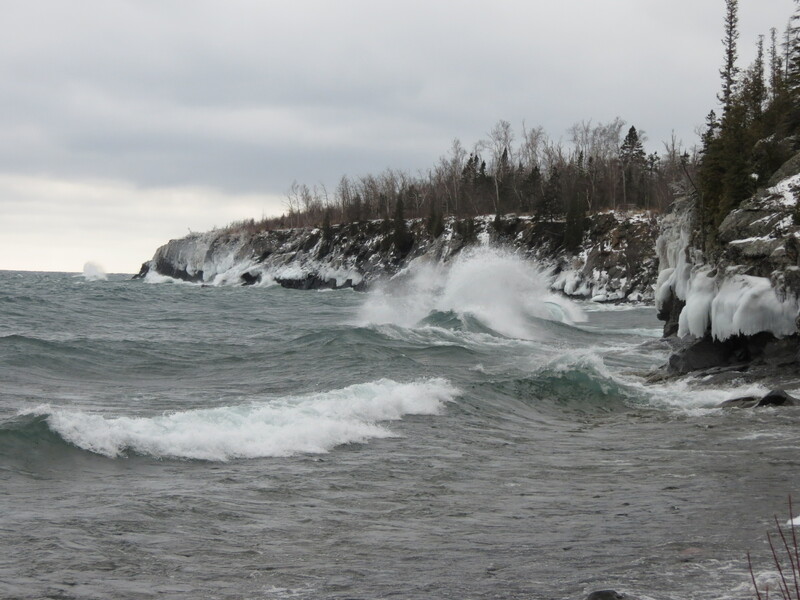 As a result, we had to drive all the way to Split Rock Lighthouse before we found enough open water for some real wave action. But the paths through that park brought us down to an action-packed shoreline. Just past Ellingson Island across from the light house, we found plenty of wind and waves. We were buffeted by the wind as much as the water was, and it was a tricky business picking our way across the icy, snowy rocks and standing up against the gusts. The wind was relentless as were the waves, pounding one after another against the shore and filling our ears with the roar of the water. C ontinuing on to Beaver Bay, we spotted another good display from the road. 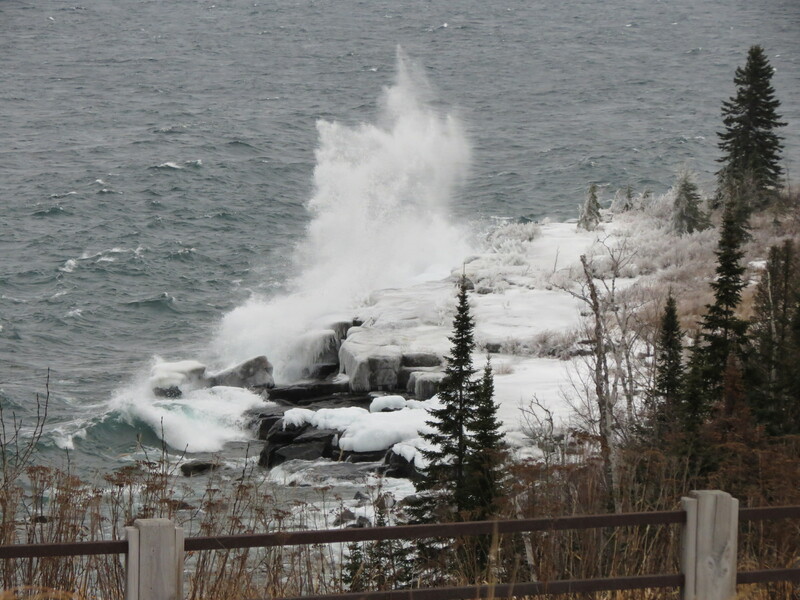 It was worth stopping to watch, as the crashing water shot up high into the air above the icy rocks. Heading back to Duluth, we were amazed to see bright sky and sunlight on the horizon. That necessitated a stop at Brighton Beach. There the wind had an entirely different effect upon the lake. 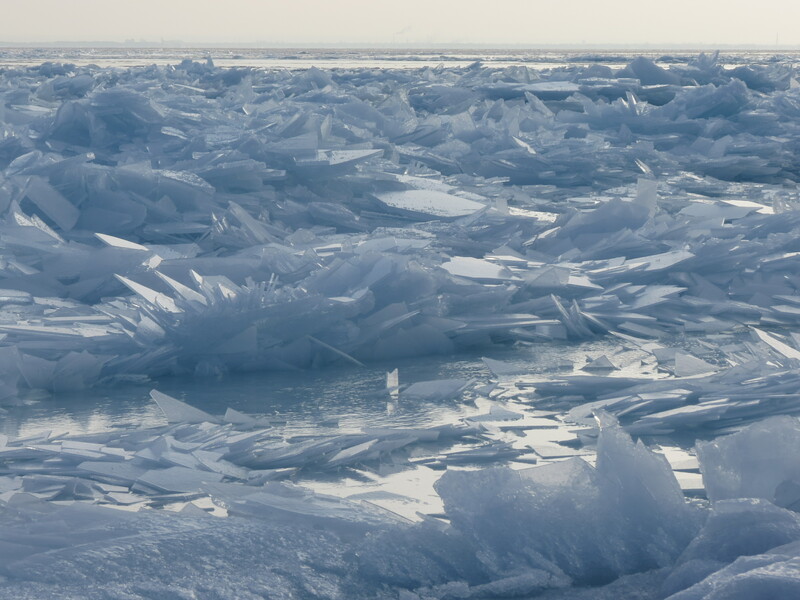 The force of the wind continually pushed the ice up onto the shore, breaking it into thin sharp shards of ice, and mounding it into fanciful formations. Over the sound of the wind, I heard something else. 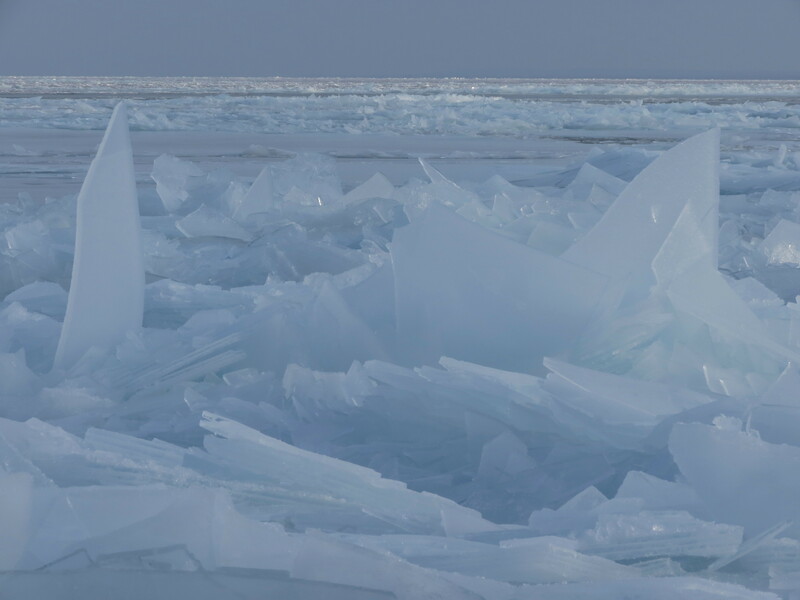 Looking out across the ice, I could see an icy river moving by, pushing and crunching whatever was in its way. Sure enough, the wind was continuing to move the ice down the lake, destined for another pile-up further along the shore. It was relentless that wind. I may not have appreciated its force on me, but its fury in nature was worth venturing out to see. Indeed it was a mighty wind. This entry was posted in Outdoors and tagged Duluth Minnesota, Lake Superior, Outdoors, Photography by Molly. Bookmark the permalink.